In 2014 fashion weeks, designers are challenging their innovation in fashion design; new ideas are mixing with architects, scientists and researchers to ultimately convey the new ideas about fashion. This feature highlights the potential of everyday wearable accessories that can be created from any resources that are around us. Here at Perfect Labels and Lanyards, we have successfully created a new innovative woven and embroidered patches using industrial fabric to add 3D and contemporary effect in the weaving and stitching texture. This smart and interactive fabric and stitching with vivid silk threads are being considered as fibres that convert sunlight into electrical energy to create solar-like woven and embroidered patches. These new connectivity and imagination of how we use fabric and material in the fashion and respond to our environments seem to take fashion into the future that is beyond the conventional concept. Computational Design, 3D effect in fashion design seems to catch everyone’s attention. Our embroidered patches are stitching the pattern (design) onto a fabric to create a raise-up weaving image. The vivid, dynamic silk threads can also create a contemporary 3D effect. There are two finishes for woven badges: merrowed (overlocked) which are hardwearing stitched around the edges, which also creating a new form of aesthetic. Another finish is laser cut edges; it is totally sealed edges. 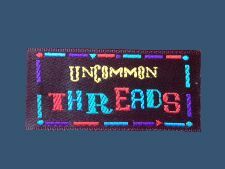 Iron-on backing is a convenient way to attach woven badges onto garment.